Treating people with Alzheimer’s: The non-pharmacological approach. On 2 January 2018, National Public Radio’s Terry Gross interviewed British neuroscientist Joseph Jebelli, who discussed Alzheimer’s disease and how “much better treatment” for the disease is about ten years away. The improved treatment to which Dr. Jebelli was referring was pharmaceutical/biomedical treatment. Indeed, the vast majority of stories in the mass media about treatment for Alzheimer’s focuses on the long hoped for biomedical treatment, emerging from drug trials or genetic approaches or both, that can stop the progress of the disease or prevent its occurrence. There is, however, a vast difference between treating a disease and treating people diagnosed with the disease—and this difference is especially critical where people diagnosed with Alzheimer’s and their families and friends are concerned. 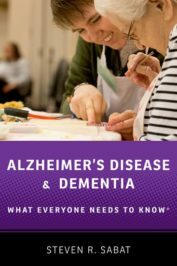 At present, there are more than 5 million people in the US alone who have been diagnosed with Alzheimer’s disease and the quality of their lives and that of their care partners depends on how the former are treated. Treating persons diagnosed entails far more than attending to their biology and neurophysiology. Indeed, it necessitates that we attend to the psychological and social aspects of their lives. It requires understanding them, empathizing with them, and helping them to deal with their psychological and emotional reactions to the losses they have sustained due to brain damage, and helping them to cope with those feelings of loss. As well, it requires not focusing solely on what they cannot do, but recognizing their intact abilities to think, make memories, and have social relationships with others. It requires that we see the person diagnosed with Alzheimer’s as a person who has a great deal in common with people who are not diagnosed. All of this requires first that healthy others understand the point of view of the person diagnosed: what do the dysfunctions mean to him or her? How does the person’s history as an adult inform us about his or her state of mind now and what they need from others? For example, Dr. M, with whom I worked to help her cope with her losses, was a retired university professor in the moderate to severe stage of the disease. Speaking eruditely was of the utmost importance to her. One of the problems she faced as a result of Alzheimer’s disease was that she had great difficulty recalling and then pronouncing the words she wanted to use to convey her thoughts. She was desperately unhappy and angry with herself, felt great frustration, and would refrain from speaking at all in the support group she attended. Her sadness and frustration were not “symptoms” of Alzheimer’s, but logical reactions to her losses, given who she had been all her adult life. That she was frustrated and sad meant that she was able to evaluate her own abilities at present in comparison with what they were in the past (this, of course, required her to have an intact memory of those abilities), recognize the difference, and interpret the meaning of that difference. This is very complex thinking that is not factored into determining her “stage” of the disease. Treating persons diagnosed entails far more than attending to their biology and neurophysiology. At the beginning of our association, Dr. M’s husband was always present at home when I met with her. After the first few months, he told me that his wife was always more alert and energized on the mornings when I was coming to speak with her than she was on other mornings. This is another important observation, for Dr. M knew that she and I were going to be engaged in conversation about things that mattered to her. This means that a person with Alzheimer’s can have a sense of purpose and meaning in life and can want very much to be engaged with another person in an enlivening way given their interests and long-held dispositions of personality. There is a tremendous difference between enlivening and meaningful social interaction with others and spending time alone in front of a television that presents something that holds no value to a person. Under the latter circumstances, is it any wonder that people with Alzheimer’s fall asleep—if for no other reason than boredom? The social and personal treatment of people diagnosed with Alzheimer’s disease can be helpful and enlivening or it can be stultifying. If a person diagnosed can experience enjoyment and even delight from his or her interactions with other human beings, it is incumbent upon all of us who are deemed healthy to provide the resources that allow that to happen. There is a lot more to “treating” people with Alzheimer’s disease than biological treatment. There is psychological and social treatment as well. Although “much better treatment” in the pharmaceutical realm for people with Alzheimer’s may be ten years away, it is entirely possible for people diagnosed and their loved ones to enjoy “much better treatment” right now. Featured image credit: Grandma and Grandad by Ben Smith. CC BY-SA 2.0 via Flickr. Steven R. Sabat, Professor Emeritus of Psychology at Georgetown University, is a three-time recipient of the Edward B. Bunn Award for excellence in teaching and a recipient of the College Dean's Award and College Academic Council Award for excellence in teaching at Georgetown. His research has focused on the remaining cognitive and social strengths, and the subjective experience of people with Alzheimer's disease. He is the author of The Experience of Alzheimer's Disease: Life Through a Tangled Veil (Blackwell Publishers, 2001), co-editor of Dementia: Mind, Meaning, and the Person (Oxford University Press, 2006), and Alzheimer's Disease and Dementia: What Everyone Needs to Know® (Oxford University Press, 2018).